When I opened up the refrigerator this morning I knew what I would find there. Still, I was still totally caught off-guard by the wave of emotions that hit me when my eyes fell upon the package of Smithfield bacon. I didn't put it there I didn't purchase it, nor was I asked to buy it by a non-vegan family member. He knows I wouldn't anyway. He simply purchased it to have a BLT when he sits down later today to have lunch with my mother-in-law who will be visiting for the afternoon. This is the first package of bacon that has come into our home since Joy and I went vegan. When I looked at it, all I could see were the faces of the pigs on the trucks headed to the Smithfield packing plant. 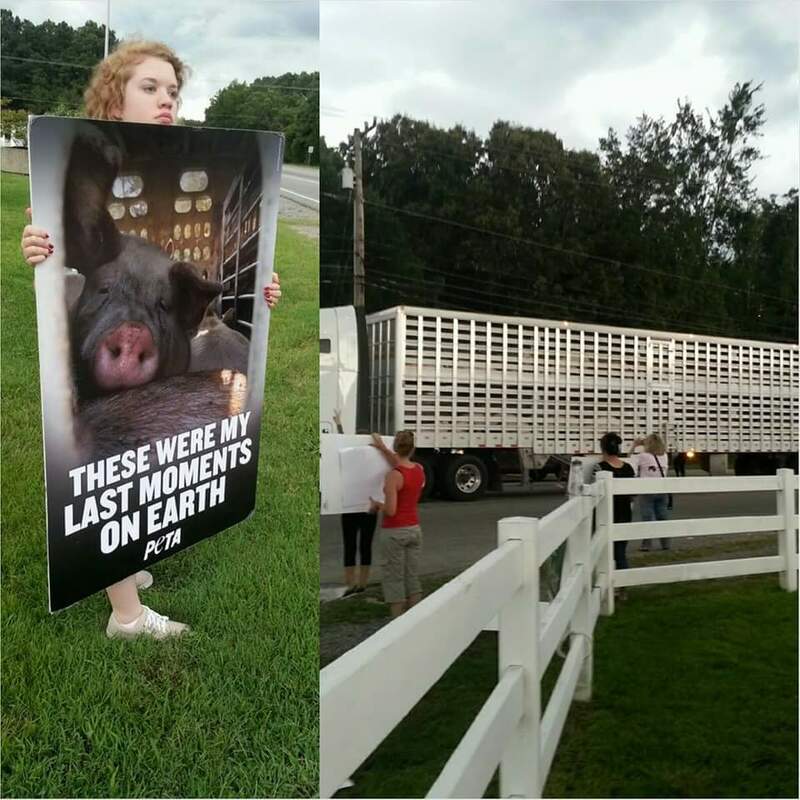 The ones Joy and I bore witness to as we stood at a rural highway intersection holding signs and watching them roll by truckload-by-truckload. The ones we had seen up close. The ones who had no voice. Knowing that she would probably come unglued at the sight of it I put the bacon in a brown bag so that she cannot see the label. Her heart would be broken too. This is where it gets really hard to be vegan. We are entering fall -- the season of family get-togethers and holiday celebrations. Joy and I are going to be the odd ones out. We'll be the ones bringing the vegan side dishes and desserts. It will be hard for us, not because we will miss the turkey and ham but because we know animals were abused and killed to put those meals on the table. It will be hard because we will be asked why we have chosen this lifestyle, how we could possibly give up meat, how long we think we will "stick with it." We will have failed to convince those we love most that there is a better, healthier, more compassionate way to celebrate and enjoy one another. Dear family and friends, when I come to your house for Thanksgiving or Christmas I promise to leave my tears at home and come with a smile on my face, though my heart is breaking. Thank you for understanding that my refusal to eat the meat you serve has nothing to do with my love for you but rather my choice to no longer contribute to the suffering of animals. I love you no less for choosing to eat meat. I respect your choice. Thank you for respecting my choice enough to not be offended when I say "none for me, thanks."